Incorporating the real-world needsof racersand street car enthusiasts, UUC's "rationalized" brake packagethat uses a 4-piston caliper manufactured in the USA by Wilwood Engineering with specific piston sizes for the E30 3-series to providebetter braking, lighterweight, and idealized front/rear brake bias, all in an affordable package with a large offering of performance street and race pads. 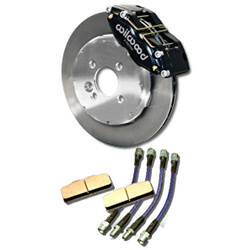 Our front kit features a 2-piece 11.75" rotor with genuine Wilwood Engineering rotors and calipers. Requires 15" or larger wheels. Low clearance means no spacers for someof the most popular 15" race wheels. Dust boot piston seals for long-term reliability whether used on street or track. All consummable parts easily available; uses a standard Wilwood pad shape (7812) or other-brand equivalent (Hawk HB542x.490) and standard Wilwood 11.75" rotor. All kits include stainless steel brake lines(including rear lines), Hawk HP-Sport street pads, and all brackets and hardware required for installation. Are the pistons sized to prevent too much forward brake bias? Yes, they certainly are. We keep a comprehensive database of all of the factors of the OE BMW brake systems (pad/piston/rotor dimensions, brak eline pressure, etc.) for which we develop brake kits. With the E30, we are within approximately 1% of perfect mechanical bias match. The term "mechanical" bias is used when examining all of the attributes with assumptions about identical pad material. Keep in mind that bias is significantly affected by pad material choice, the difference in coefficient of friction (cF) of a pad material has an even greater effect. For example, switching between two different but similar street compounds (specific examples: WilwoodBP-10 vs. BP-20) will have a 3X greater effect, literally almost 4% shift in whichever direction, front or back, that has the higher-cF pad. Is this kit legal for BMW CCA ClubRacing? The 4-piston Wilwood caliper is legal for various SCCA and BMWCCA classes that limit piston count. Is this kit a good deal? I thought I saw kits online for around $100 less. It's really a good deal when you consider what you get from similarly priced kits elsewhere. "Similarly-priced kits" for about $90 less come with 1-piece rotors and weigh substantially more. For about $150 less, you can buy used RX-7calipers with the same heavy 1-piece rotors. Both of those options require a custom-modified rotor each time you need to replace it - so you're spending over $200 each time you need rotors! The UUC kit uses an easily-available standard Wilwood rotor at around $40 apiece. Any plans for a matching rear kit? Our front kit is designed to be correctly balanced (as to brake bias) with the original rear brakes. No change to the rear brakes (other than matching or similar pads, and the SS lines which we automatically include) is necessary to retain proper bias. A good brake upgrade is not just going "huge"... in fact, if you review all of our competition brake packages for other BMW models, our rotor and piston sizes are"appropriate". The problem with doing a rear brake kit is the expense; as you can see on any E30, the rear rotor's central hat is very deep. To build this asa 2-piece rotor like our fronts would require a large piece of aluminumwith much of the interior machined away... which would make it substantially more expensive than the front kit. Knowing the frugality of the typical E30 enthusiast, the necessary price to build the rear kit would likely deter many potential customers. We're not saying we absolutely will never do a rear kit - just not at this time. Another thing to realize is that from a true performance perspective, especially with engines that are not gifted with an overabundance of torque, keeping the rotating mass of the drive wheels low is beneficial. Adding large rear rotors has the same effect as heavy wheels, your car will accelerate slower. What kind of caliper isused? The Wilwood Dynapro Dust-Boot (DP-DB) model of the Dynapro lug mount caliper was developed for applications that require or prefer a dust-booted piston. Dust-booted aluminum pistons provide added protection against road or track borne dirt and debris on low to intermediate temperature range applications that may also operate in harsh environments. The pistons are clear anodized to eliminate corrosion while providing added lubricity for drag-free operationwithin the bores. The dust boots work in conjunction with high-temperature square faced internal seals in the caliper bores to provide optimum performance, ultimate reliability, and quick turn around at pad service intervals. The DynaPro is loaded with other enhancements for performance and durability. The calipers feature Quick-E-Clip pad retainers that support a 7812 type brake pad from the top. Not only does it allow for fast pad service without caliper removal, the bottom pad supports have been removed to create a slimmer profile that can be more easily fitted into tight clearance applications. An optional bridge bolt kit, P/N230-10188 is also available to provide additional body strength and fortified pad retention in the center of the caliper bridge for extreme high pressure, high load applications. Heavy wall Aluminum pistons are used to resist corrosion. The heavywall sectional thickness also provides additional strength against backside deflection to provide a firm pedal feel and efficient clamping, even at the high pressures generated by power boost systems. What exact type of rotor is used? Wilwood brand Ultra-Light UL straight vane rotors provide high value performance and rugged durability for a wide range of competition, high performance, and sport driving applications. Don't confuse these rotors with bargain priced off-brand named parts. Wilwood's modern manufacturing capability, combined with large scale economies, make it possible to offer this level of quality and performance at such an affordable price. techniques hold close tolerances on face and vane thickness. Combining the correct face thickness with a 30 or 32 vane casting provides superior heat management and long service life with low rotating and unsprung weight. The straight vane design also makes it possible to use the same rotor on left or ight hand mounting locations. We've got MOD-class racers using this rotor now for a few years, as we have been using this rotor with our previous Wilwood caliper kit. If there is the desire to upgrade to a different Wilwood rotor, we will gladly make the swap. The great thing about the UL-32 is the replacement cost, about $40 each disk. An upgrade to the Wilwood 160-7701 HD-36 "heavy duty" curved-vane rotorwould be about $90 additional to the kit. If this is something a potential purchaser of the kit would like, we request that they call us for the substitution. We also offer a drilled/lightened version of the UL-32 rotor. This rotor is .9lb lighter than the standard rotor, ideal for competitive auto-x and race use. Caution on drilled rotors:There is a common mis-perception that rotors are drilled to improve cooling. The reduced mass of a drilled rotor will dissipate its retained heat quicker, but it also builds up heat a much faster rate. The decision to use drilled rotors should be solely based on the merits of the lower rotating and unsprung weight, and not for improved cooling. It is not wise to use drilled rotors in sustained high heat on hard braking tracks unless the team budget affords a high frequency of rotor and brake pad replacement. What kind of duty can the kit withstand? From what we have tested, potentially anything reasonable on street or track. We have had MOD racers using our previous kit with excellent results. No complaints, no issues... the only time we hear from these racers is when they are ordering replacement pads and rotors! Our caliper is built to the highest racing standards with high-temp seals and stainless pistons, with a caliper body stiffness that is unequaled among similar-size calipers. Is the kit using a fixed or floating discs system? Our rotors are a 2-piece design, aluminum hat with iron rotor.Technically, this is not a floating rotor. The decision to omit the floating mechanism was based on a lack of actual need. With this relatively small diameter rotor, thermal expansion is minimal. Adding the cost, complexity, potential for rattling, and hardware wear factors into the mix do not present themselves are reasonable. Again, our MOD racer example is the "proof in the pudding". We have yet to see an E30 in a motorsport exercise with greater speed or power, and this exact rotor configuration has been serving them well for years. 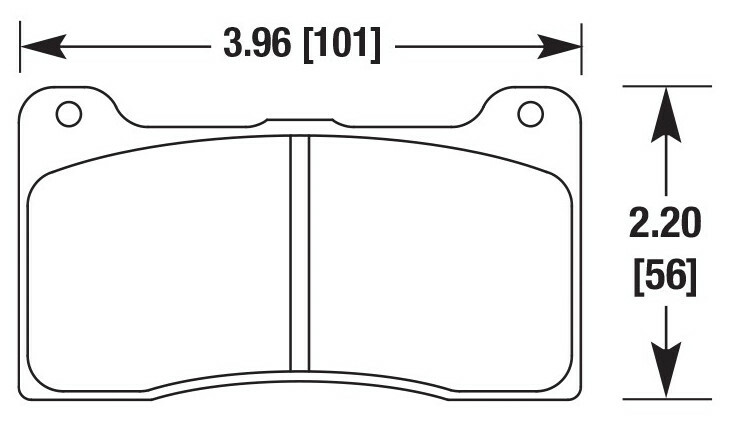 What are the pad thickness and area? We have chosen the .490" pad thickness variation to minimize caliperexcursion beyond the wheel hub plane, in order to maximize wheel clearance. One may make the point that a .490" pad is not very thick - yes, it is not, so it has to be changed more frequently. With this pad shape being so reasonably priced at around $55-$75 a set (depending on material),who cares? When you compare this to the typical Wilwood .800" pad costing $95-$160 for the same materials, you can see there is direct cost parity. In all practical reality, it is preferable to replace race pads more often anyway. One issue we have seen with thicker race pads in our many years of track and race experience is that repeated heat cycling of a track pad will make it "cook out" - they lose effectiveness. We usually replace the thicker race pads before they have worn out simply because they do not work as well. From that perspective, the thicker pads are less of a value. How stiff are the calipers? As above, the equal or superior of any comparably-sized caliper. There is no reasonable cross-brand stiffness factor that is realistically measured, so the question itself has little objective value. What material are the pistons? Heavy wall aluminum, andozied for additional protection and lubricity. How many pad compounds are availablefor that caliper? Wilwood: A, B, E, Q, CM, BP-10, and BP-20. Hawk: all major compounds, including DTC-70, DTC-60, DTC-30, DTC-05, Black, Blue, HT-10, HP-Plus, HPS. 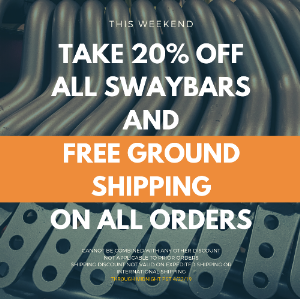 Effectively any manufacturer that makes a Dyna-fitment pad will either have the exact shape, or a minor modification to the backing pate will allow their pads to fit. From Greg Kidd of suwanee, Georgia on 3/10/2017 . From Doug Wl of Frederick, Maryland on 9/26/2015 .